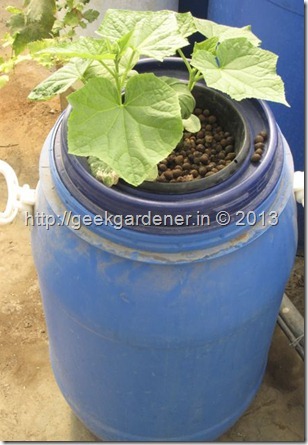 In this article we are going to see how to grow cucumber hydroponically. If you remember, I had posted a two part article on exactly this topic!. So why another post on this topic? Read on.. you will know. 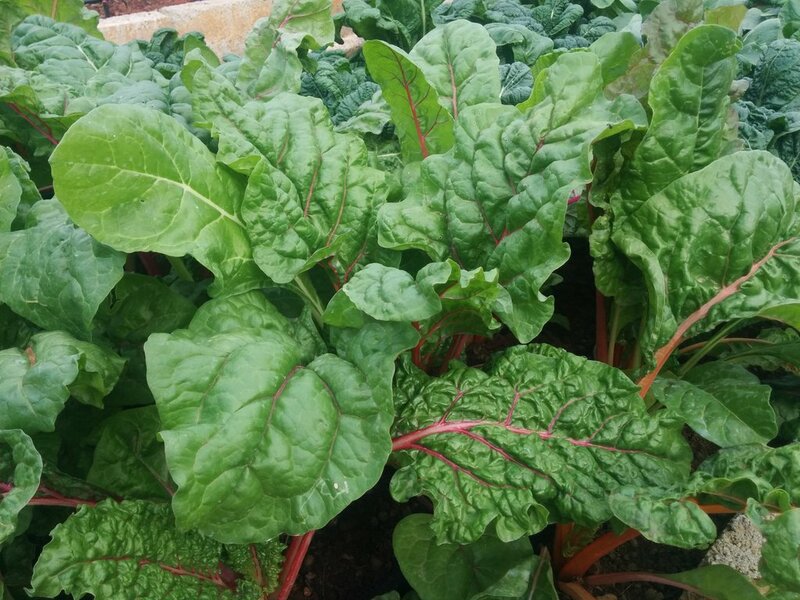 When you have a vegetable garden in your terrace, watering them daily is very very important and it can become very tedious if you have too many plants growing. How do we solve this problem? Automating the watering via a drip irrigation is one way. But can be improve it further? What if we have a system in which we don’t have to water the plant at all. Sounds crazy? Impossible? One would think so.. I was looking for a system that will try to reduce maintenance if not completely avoid it. By maintenance, I mean watering, adding fertilizer etc. Since water availability is also a concern, I added another constraint. No water wastage( via drainage). 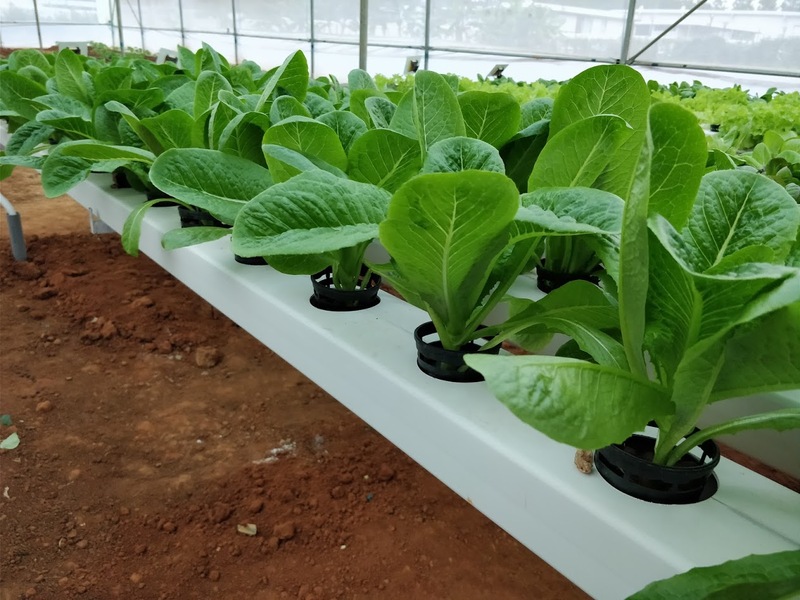 In that process, I checked different hydroponic systems to see If i can achieve my goal of having a system that is very easy to maintain ( read it as no maintenance ), no need to water everyday and very easy to build. Though the goals are only 3, they are very difficult to achieve considering the fact hydroponics is known to be not “simple”. So I decided to try out a system I read about few years back. 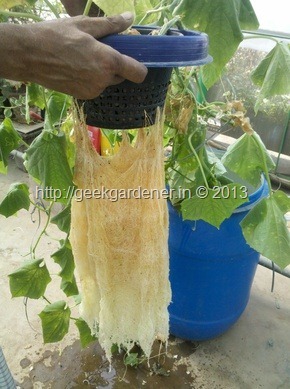 This system is called ‘Simple Non-circulating hydroponic system’ and was invented by a scientist called Kratky. This system is the simplest of all and works like a charm* . To build this system, you will need the following. I am going to give you the following steps for the system setup. Raise the seedlings from seeds. 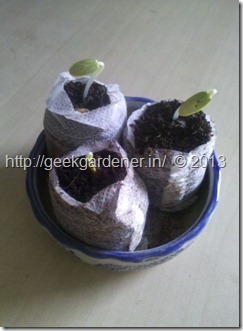 Step 1 – Raise the seedlings from seeds. 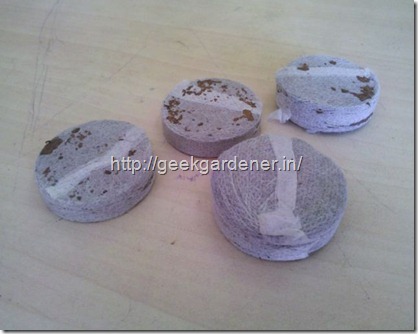 Expand the cocopeat pellets and sow the seeds in them. In about a week’s time, the seeds will germinate (sometimes sooner). 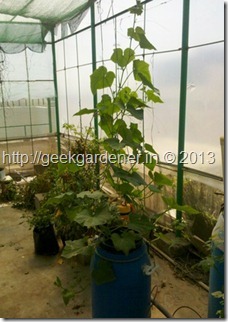 Water them with half strength nutrient solution till they have two true leaves. If you don’t have cocopeat pellets, you can also use expanded clay/coco chips. But if you are a beginner, it is easier to use cocopeat pellets. Once you add water and expand they should look like this. The best thing about using cocopeat pellet is it is so natural and the plant roots form as it would in soil. Regarding the water holding capacity, cocopeat pellet wins. With the biodegradable sack around it, it is my first choice for any seedling nowadays. The fabric is so thin it allows roots to penetrate through it, which is exactly what we want in a hydroponic system.A seedling germinated in cocopeat will look like the picture below. It is important to not let the pellet dry out. Once true leaves form the seedling is ready for transplanting. 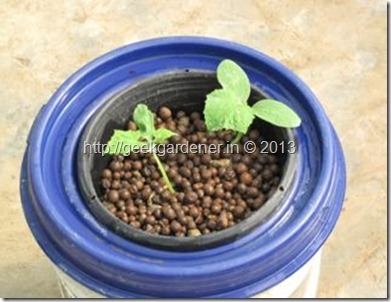 Prepare the Net pot/pot for transplanting the seedling by filling it with Hydroton. Hydroton is a brand name for expanded clay. 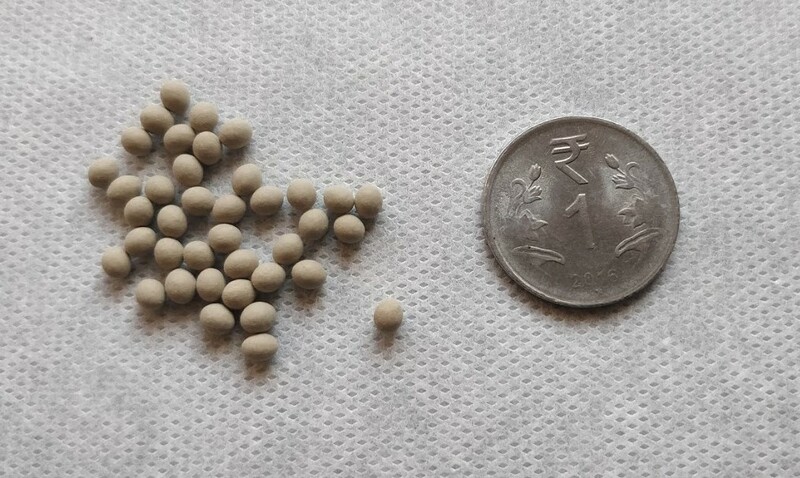 Expanded clay is made by heating up small clay balls to a very high temperature.Due to the water contained inside, they pop up to form a light weight growing medium. Wash the expanded clay to get rid of all the dust. Once it is clean it is ready to be filled in a netpot. If you have net pots (bigger ones), then most of your job is done. If you don’t you might want to make a pot with lots of holes in the bottom. Make holes that are large enough to hold all the expanded clay. 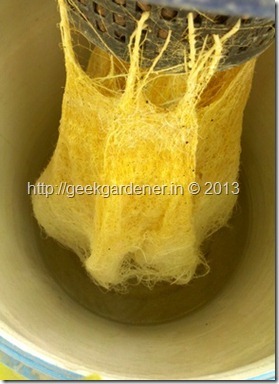 Larger holes will cause all the expanded clay to fall out the net pot into the nutrient solution. 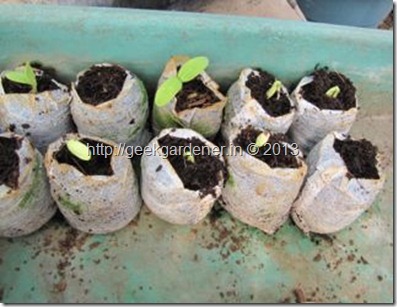 Transplanting the seedlings is very easy if you used Cocopellets. Cocopellets are also called as rooting plugs. 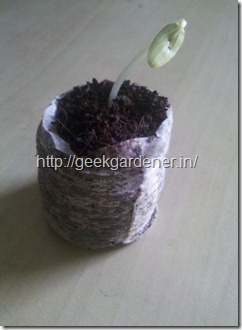 It is as simple as just taking the seedling and placing it in another pot. 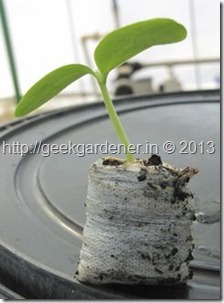 Now your seedling is transplanted into a pot that contains Hydrotons. Proceed to next step. Now this needs a little bit of work. The idea here is to make a hole large enough to make a pot fit in. Depending on the pot size, you can make a hole in the lid. If you have jigsaw/cutting machine at your disposal, then making a hole is piece of cake. If not you have have to make circular mark and use a hacksaw blade to make a circular hole. They are lots of tools available in the market for these things. Suit yourself. In the picture below, I used the lid of a paint bucket to make a the hole. I later filled with expanded clay and transplanted the seedlings. Transplanting is as simple as taking the plants in rooting plugs and placing it over a layer of expanded clay balls and fill the rest of the pot with expanded clay. Isn’t that easy? Step 4 – Fill the reservoir with Nutrients. Now comes the best part. Remember I was saying how easy this system is? The drum/barrel is about ~75 ltr capacity. The barrel is filled with nutrient solution (bloom formulation) to a level such that the bottom of the netpot barely touches the nutrient solution’s top surface. When we transplant the plant, the roots would not have come out of the netpot so it may take few days for the roots to come out of the netpot and drop into the nutrient solution below. Till then care is taken to not let the netpot with expanded clay to dry out completely. Just water it with nutrient solution every morning. 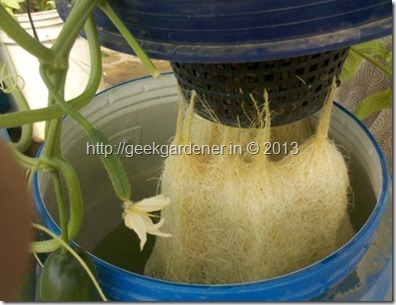 It will only take 3-5 days for the roots to emerge out of the pot and start to reach down for the nutrient solution. This is aided by the high humidity that is formed in the barrel. About two weeks after setting the plant on the barrel the roots have started to get a nice shape and are already looking like Santa’s beard. I am sure you might want to see how the plant looked at the time, looking at these healthy white roots. Now you might ask me, what happens next? The answer is very simple. The plant grows taking the nutrients from the solution happily and yields all it can. As the plant grows, the nutrient solution level goes down. As the nutrient solution goes down, the root also reaches down by growing deeper. Wanna see? 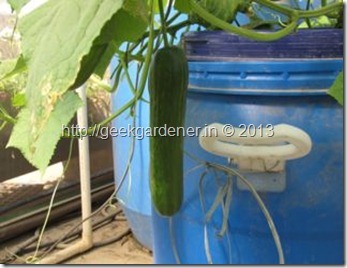 In the above image, you can notice the big cucumber in the bottom that is ready for harvest and a fruit’ling ready to become a cucumber one day. 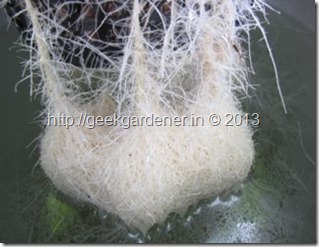 The roots are no less, they grow as vigorous as the shoot and the following picture is the proof. It is so awesome to see all of the roots of a plant. I ended up showing this to most of my friends and relatives who come home and they were speechless. With conventional method of growing plants, uprooting is the only way to see the roots and that marks the end of the plant. Not in Hydroponics. After the roots entered into the nutrient solution, I stopped taking care of the plant. Totally. No watering, No fertilizing. Just observing the growth every day, taking log of whole lot of parameters and watching out for pests. How cool is that? So how long can this plant continue ? 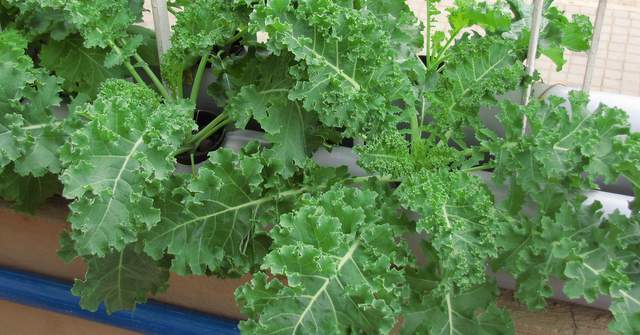 The plant continues to grow as long as the nutrient solution is present. In the image picture on the right above, you can observe that the roots have almost touched the bottom and there was only couple of liters of nutrients. Even then the plant showed no sign of stress except in the middle of noon. At that point, we got ~36 cucumbers from two plants. This was with 2 plants on a 75L barrel. If you double the reservoir size and reduce the plants to just one. You can reap the benefits for another month. More than the yield, I am impressed with the low maintenance part of the system. Especially when I started this cucumber plant, we had a baby and there was no time for gardening and this system came to the rescue. There is one important detail I must mention. When the plant is growing at a good pace, the nutrient solution level goes down very rapidly. If you are in a location that is very hot it the nutrients can go down much faster. You can increase the reservoir size to suit your location. 200L is best if you can get one. One thing you cannot do is to add more nutrient solution when the tank depletes. It will mostly kill the plant. What happens is, when the level of the nutrients go down, the roots develop lot of hairs to absorb moisture from the humid environment. 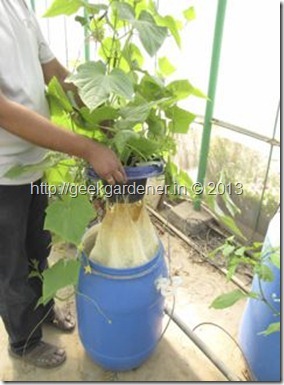 When you refill it with more nutrient solution, it suffocates the roots and they will rot due to drowning. You can experiment with maintaining the level same but don’t increase the level it will definitely drown the roots. Net pots (Big) – Available at the store. If you want more updates follow me on facebook. 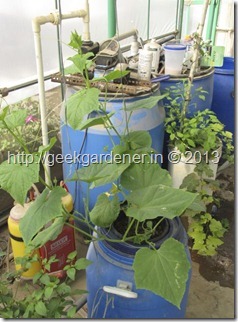 On my next post, I will write about the Building an Ebb and Flow system and growing gourds in it( Bottle Gourd). 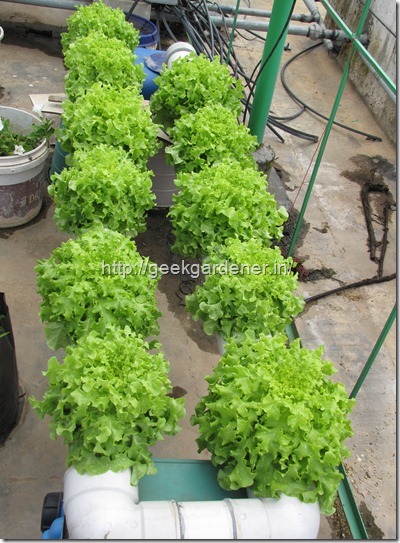 Can you please suggest me from where can i purchase some material for hydroponic production fro home. Welcome Back to your own blog :). I would suggest a small change to this. How about adding an air pump when it is time for refilling the NS? There should be enough oxygen to prevent the roots from rotting and then you convert this into a DWC system. Is this an option? BTW, I am taking a different approach of an earth box for the organic gardeners with the similar goal of no / low maintenance wherein I would have pipes to refill the water in the reservoir. I have all the stuff with me ready only thing missing is the time :(. Lovely post ! Can you please tell me where did you get the nutrient solution from ? I want to replicate this in my garden. Thanks. I prepare the nutrient solutions myself. Where are you located? you can get it from our store if you are interested. I am in Delhi. 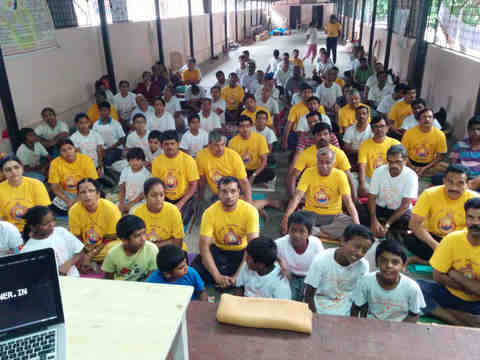 Is it possible to home deliver if in Delhi or through courier if from other state. The minimum requirement for one time use. What all plants can be grown in this Hydroponics technique? 4 as you know temp in punjab is it very compulsory to use greenhouse can use direct sunlight and what should be the maximum temperature for this unit to work can i use shadow by wall? I sent you mail a month earlier too but still did not get any reply from u.
I have read almost all the post and was very much impressed. I’m new to container garden and I started with spinach and coriander (easiest ones i guess). I do not understand technical terms in fertilizer and their ratios. So in layman term can you please explain it to me (I live in bangalore and I usually buy fertilizer from Lal Bagh and they r black in colour like compost). Also can u please let me know where can I get cocopeat pellets in dry form? Thanks for writing to me Tenzin. Good to hear that you are relocating your house to get gardening started. good luck to you and see you around. 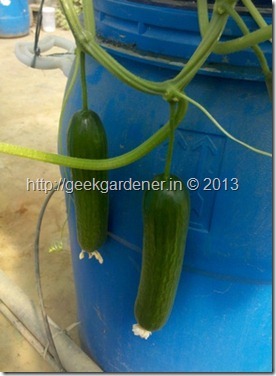 Do you have a video tutorial on growing seedless cucumber in hydroponics? 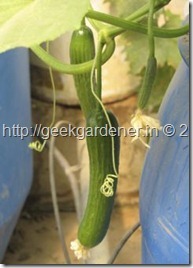 It makes me realize to grow cucumber in my own backyard as I and my wife consider this as one of our favorites. Is there an alternative for clay? I am happy to see your efforts to grow vegetables in terrace. Can you let me know where to get the Bloom solution that you had referred in you article. i am in delhi and wonder where to get hydroton? meantime can we use cocopeat and other two mixtures in place of hydroton? Do you have seeds for very long murunga variety? I ahve a hybrid murunga tree which flowers well but does not produce many fruits.all the fertilised flowers fall off.What is the reason? How to rectify it? Great system. Everything is ok. 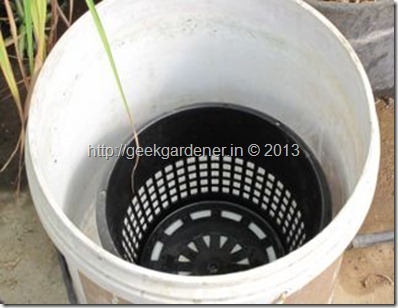 But during rain, water will get into the drum through the hydroton. Any idea to manage this issue ?